A 12-person jury has found Chicago police Officer Jason Van Dyke guilty of second-degree murder for the 2014 shooting death of Laquan McDonald – a heater case that has spurred widespread protests and police reforms through the city in the years since charges against Van Dyke were first filed in 2015. Van Dyke shot 17-year-old McDonald 16 times following a police call on Oct. 20, 2014. The case lagged for years after charges were filed, but the trial itself moved more quickly than expected, with testimony lasting less than three weeks. Van Dyke was also convicted on 16 counts of aggravated battery with a firearm, but was found not guilty of official misconduct. He bail was revoked immediately after his conviction and he was taken into custody. 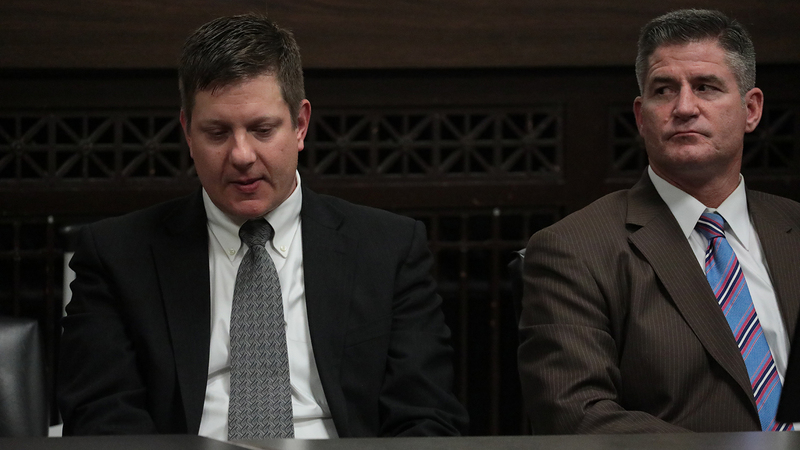 ///BREAKING/// Chicago police Officer Jason Van Dyke has been found GUILTY of second-degree murder in the 2014 shooting death of Laquan McDonald. Instead of a possible life sentence, Van Dyke faces four to 20 years in prison for a conviction of second-degree murder and six to 30 years for the aggravated battery charges. A second-degree murder conviction could also result in probation rather than prison time. Closing arguments ended Thursday afternoon following testimony from 44 witnesses. Jurors began their deliberations just before 12:30 p.m. Thursday. About five hours later, jurors made two requests to Cook County Judge Vincent Gaughan: to review a transcript of testimony from Joseph Walsh, Van Dyke’s partner on the night of the shooting; and to be allowed cigarette breaks because some jurors were having difficulty concentrating. Both requests were granted. Gaughan then promptly ended deliberations for the day and sequestered the 12-person jury and three alternates. They returned to court around 9:30 a.m. Friday morning and resumed deliberations. Van Dyke testified in his own defense Tuesday, saying he started shooting only after McDonald raised a knife at him, and continued firing when McDonald tried to get up off the ground with a knife still in hand. Several jurors believe that was a misstep. But lead defense attorney Daniel Herbert argued the officer acted according to his training and was justified in killing McDonald, who Herbert said could have ended the situation by simply dropping his knife. “That man is the toughest man I've ever met in my entire life,” Herbert said of Van Dyke after the verdict, comparing his case to that of a boxer going into a heavyweight fight against Mike Tyson with both hands tied behind his back. Just before 10 p.m. on the night of his death, McDonald was found inside a private truck lot near South Pulaski Road by driver Rudy Barillas, who told the teen to leave, believing he was in the process of stealing radios. Barillas called 911 before McDonald – who was high on PCP – lunged at him with a knife and fled the scene. Barillas was uninjured in the attack and can be seen on dashcam video pointing the approaching officers in McDonald’s direction as they pull up to the lot. Police learned at 9:53 p.m. that McDonald was armed with a knife, which he used to pop the tire of a pursuing squad car at 9:56 p.m. Within six seconds of doing so, Van Dyke moved closer and began shooting McDonald, who spun and fell to the pavement. After McDonald fell, prosecutors say Van Dyke continued firing for 12.6 seconds – a second volley Van Dyke said was intended to shoot the knife out of McDonald’s hand. Another CPD squad vehicle carrying a Taser arrived on the scene less than 30 seconds later. More than a year later, Van Dyke was charged with first-degree murder in McDonald’s death on the same day the dashcam video was made public. Those charges, and an alleged cover-up of the shooting, played a big role to the dismissal of then-Chicago Police Department Superintendent Garry McCarthy and the election defeat of then-Cook County State’s Attorney Anita Alvarez. Police officers across the country are rarely convicted of murder – or even charged with murder – as a result of an on-the-job shooting. A Bowling Green University researcher last year found only 80 officers were arrested on murder charges stemming from those types of incidents nationwide between 2005 and 2017. Of those, about 35 percent have been convicted, while the rest were either acquitted or still face pending charges. After the verdict, Herbert said he feared the conviction would have a chilling effect on police. He thinks in the future officers who come upon someone acting the way McDonald was will roll up their windows and wait it out. But special proseutor Joseph McMahon argued Van Dyke has “committed serious crimes” and must be held to the same standard as any other citizen.